You guys have the Hershey headquarters don’t you? Have you been there? I love chocolate. No but I remember it from a Miss Texas pageant. Miss America was demonstrating introductions and she was from Hershey Pennsylvania. Hehe I have a friend who used to live in Melbourne! Or maybe she still does and I’m thinking of a different friend… I have several friends from Australia for never having been in that country. Aren’t they amazing? We’re loving them as well. Welcome Virginian Leila to Ermiliablog. My name is Ermisenda (the other co-author of Ermilia, don’t worry, we ARE two different people rather than split personalities :P) and I was born and live in Australia but my family is from the Canary Islands, Spain. Yay for our multi-cultural readers! No, don’t listen to her. She lives in my head. There’s no pictures of us together. Coincidence? I think NOT! Hi, I’m Angie from Ohio, USA. Welcome Angie, anything special about Ohio you want to share? My Mom is from Ohio, we’re going over there next month. It’s such a beautiful and under-rated state. Hey Eliabeth! Ritesh here, and I’m from India. Hi Ritesh! 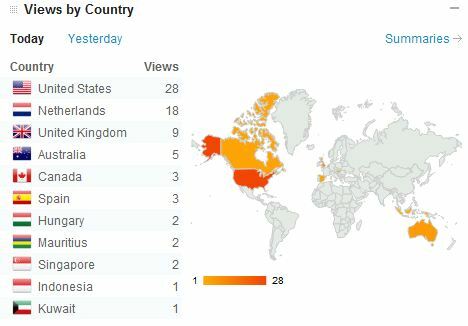 So neat to have someone from India reading our blog. I’ve rarely appreciated the internet as much as I do now. I appreciate it as well! On my blog I’ve got people from Croatia, Panama, Qatar, Zimbabwe, Guyana, Kenya and so many more countries! Isn’t it awesome! I wanted to show the whole list, but used today’s rather than the master list. There’s countries I don’t know how to pronounce on there. Such a fun learning experience to get us all talking and learning about our countries. I want to visit Scotland. I think I’m an 8th Scottish. From the McGregor clan; I always knew I was royalty, never mind that it’s a few generations off. I remember there being something about the McGregor are descendants of King Alpin from the 3rd C BC, maybe it was a brother? Welcome Patricia, I could never deal with y’all’s weather. I’m Rachel, I live in Manchester in England. I’m not sure what the stereotype would be for Manchester other than maybe football hooliganism?! I hate football so I don’t know about that one. I would love to ride a kangaroo to work! Football is the only thing that comes to mind for me as well and that’s only because of the Manchester team in the movie Euro Trip. Hey Eliabeth! I’m from India. Hi! Our second person from India, that’s so neat. 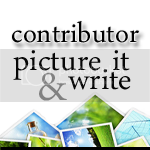 Welcome to Ermiliablog, I hope you enjoy our content. Sometimes it’s a good thing to live in a small state. In 5 hours I can be through New York City and into Joyzy or almost to the Canadian borda. I love your accent specific spelling. It makes me happy. ❤ My dad worked at a company in Dallas and got a call from one of the other buildings in El Paso needing something fixed and requesting that they someone out. "Call the California office, they're closer." True story. You make me happy. I love that we have someone from Kuwait! You have such a pretty name. Welcome! :O That’s so cool! I don’t know why I always thought you were from the US. I’m part of the US blog in California near Oakland. I have an aunt in Davis, is that close? It’s close enough that I’ve been there a few times. Hi Giovanna! I’ve only been in the Pacific ever. I’ve been in the Gulf of Mexico, but not all of the way to the East coast.